New graduates, proud parents, family members and delighted friends all flocked to Dundee to attend and celebrate this year’s Winter Graduation ceremony. The winter graduation allows students whose courses finished after the summer to receive their awards. Nine postgraduate students studying on four different courses at the Department of Orthopaedic and Trauma Surgery, TORT Centre, graduated on Friday 18th November 2017. Seven students attended the winter graduation ceremony at the magnificent Caird Hall, whilst two graduated in absentia. The TORT Centre was not only represented at the graduation ceremony by students as Professor Rami J. Abboud was awarded the Chancellor’s Award for Outstanding Contribution to Teaching for 2017 and Erin Frizzel (Intercalated BMSc 2016-2017) was awarded the Sir James Mackenzie Prize. Antony Shek, currently studying a MRes in Sports Biomechanics and Rehabilitation at the TORT Centre also received a Sports Award Colours for fencing. Antony is currently researching “The analysis of lower limb in fencers for classical technique vs natural gait” at the TORT centre under the direct supervision of Dr Tim Drew. Three honorary degrees were conferred to astrophysicist Dame Jocelyn Bell Burnell, internationally renowned businessman Dr Frederik Paulsen and Helen Jones, CEO of the Gypsy and Traveller Exchange. 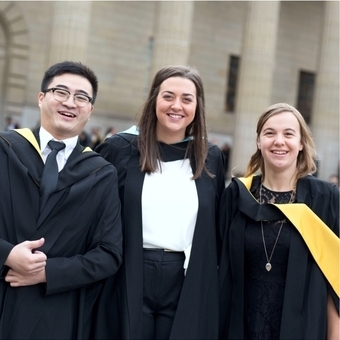 Not only would we like to extend our congratulations to our own TORT Centre Graduates but to each and every one of the near 1000 University of Dundee students who successfully felt the tap of the Dundee bonnet over the two days this week! The traditional Dundee bonnet (cap) is used each year by the Chancellor to symbolically confer degrees upon graduates. It was first used in 1971 by Her Majesty Queen Elizabeth the Queen Mother in 1971 in her capacity as the first University Chancellor from 1967 - 1971. “I was extremely proud to deputise for the absent Dean of the Medical School this year. It was an honour and a delight to read out each recipient’s name and to see the excitement and joy etched upon their faces. After years of dedicated hard work and sacrifice your futures are now right in front of you so grasp every opportunity with enthusiasm, represent the University with skill and pride, and above all, enjoy doing so! Seeing students of all ages graduate is what we all work so tirelessly for across the University, the Medical School and here at the TORT Centre which has an extremely small but dedicated staff team. I would like to thank all my staff for another successful and enjoyable year”, stated Professor Rami Abboud, Associate Dean for Learning & Teaching, Head of Postgraduate Division.